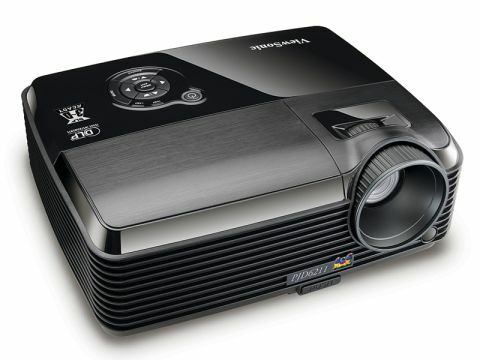 The Viewsonic PJD6211 is the most cost-effective data projector here. It takes the standard design route for a DLP device, being a squat device that sits length-wise with the lens fixed at one end and a large vent along the front. It's quite compact but with a weight of 2.6kg, is not ideal for taking on the road. You will find it is a decent machine for sharing between rooms in an office, or possibly a school. The lens has the usual manual focus and zoom rings and we found getting this projector up and running to be quick and easy. Controls on the top of the unit proved easy to get to grips with and while the menu system is comprehensive, you do need to scroll through quite a number of pages to get it set up to your liking. With a brightness rating of 2500 ANSI lumens you'll be able to use this projector in most lighting conditions with ease. What's more, it has quite a small throw range, making it ideal for use in smaller meeting rooms and school classrooms. Sadly, we found image quality to be fairly unimpressive, with the whites in our presentation test having a yellow tinge to them. Video seemed more appealing, however, with little in the way of pixelation, even during a fast action scene. Running in Eco-mode dropped image brightness down by a noticeable degree but the cooling fan continued to run noisily. Connectivity on the rear shows the entry-level roots of this device, as you won't find any digital ports. There are comprehensive analog connections for use with multiple analog sources, however, highlighting the office-based functionality of this device. Odd then that the PJD6211 comes with 3D ready support. This is due to the 120Hz refresh rate of the lens and its native resolution of 1024 x 768 pixels. The Viewsonic PJD6211 data projector offers decent value for money but unless you're on a tight budget we feel that it does have rather limited appeal.